Home Resources Water Quality Turn on the tap! DC Water delivers safe, affordable, high-quality tap water to our customers in the District. We test hundreds of water samples each week throughout the city to ensure that our water surpasses federal drinking water standards. Tap water is safe, inexpensive, and better for the environment. Unlike bottled water, tap water is strictly regulated by the EPA. DC Water conducts extensive water quality testing and reports all test results to the EPA and our customers. Tap water is more sustainable than bottled water. Uses 2,000 times as much energy to produce, package and transport. The manufacturing process requires 1.6 liters of water to produce 1 liter of bottled water. Only 25% of plastic bottles are recycled, while the rest end up in landfills and waterways. With a reusable bottle, consumers can completely eliminate plastic bottle waste. Tap water is more economical than bottled water. At about a penny per gallon, tap water is much less expensive than bottled water. Depending on the size and brand, bottled water can cost up to 1,000 times more than tap water. If you fill up a reusable bottle at any of our TapIt Metro D.C. partners, it is completely free. Tap water tastes great. According to our annual taste tests, the majority of DC Water customers prefer the taste of tap water to bottled water. DC Water hosts a Taste Test Challenge at events throughout the year. Volunteer participants taste two water samples and decide which sample tastes better. Over sixty percent of taste test participants preferred the taste of tap water or could not tell the difference between the tap and bottled water samples. DC Water, regional water utilities and the Metropolitan Washington Council of Governments partner with businesses in the metro region to make it easier to choose tap water. TapIt Metro D.C. is a network of businesses that will refill any reusable container with tap water at no charge, no purchase necessary. 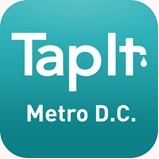 Free smartphone applications make it easy to find the nearest TapIt Metro D.C. location. We are always looking for new TapIt partners, so tell your favorite cafe or shop to join for free! For more information about the TapIt Metro D.C. partnership, please visit www.freetapwater.org. TapIt Metro D.C. offers consumers a healthy and no-cost alternative to bottled water and sugary beverages; reduces plastic bottle waste; and increases visibility and foot traffic for businesses that are demonstrating their commitment to making DC a more sustainable city.